Every bite of our Nature Valley™ Nut Butter Cups is worth savouring. 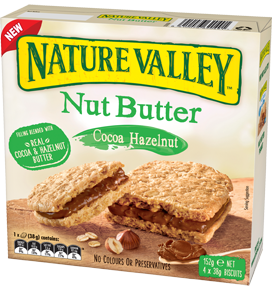 Unwrap two handy treats made with whole grain oats and a smooth nutty filling blended with real almond butter. Enjoy a little moment of indulgence towards the end of your day! Crunchy. Creamy. Delicious. Whole grain oats (38%) (flakes, flour), vegetable oils, sugar, wheat flour, glucose syrup, almond butter (5%), almond pieces (5%), fat-reduced cocoa powder, salt, corn starch, raising agent (sodium bicarbonate), flavours, emulsifier (soy lecithin), whole milk powder, antioxidant (tocopherols concentrate). Contains oat, almond, milk, soy and wheat ingredients. May contain egg, peanut and other tree nuts.